Simple Minds are one of the greatest live rock bands of all time and release their highly anticipated 15th studio album of brand new material Graffiti Soul on 25 May 2009 on The Universal Music Record Label. Graffiti Soul is undoubtedly one of the most exciting records of Simple Minds celebrated 30-year career. Widely acknowledged as one of hte most charismatic front men in music and all set to wow the crowds at this summer's Isle of Wight Festival, Jim Kerr says, "We wanted to make a full-blooded record of ballsy pop songs." Flagship single Rockets, released 18 May, is a shining example of the distinctive sound of Simple Minds - unforgettable guitar riffs, soaring vocals harmonies and hooky handclaps. Witness, too, the Spartan grandeur of Light Travels or the expansive power of Kiss And Fly, a song that proves why Kerr's rich baritone has made him, not only one of the best frontmen, but one of the biggest names in popular music. A deluxe edition of Graffiti Soul comes with a second disc of covers. During recording sessions, Charlie and Jim jammed some of their favourite classic tracks and so this bonus disc was born and tribute was paide to the artists that have inspired them including Neil Young, Magazine, Massive Attack, Thin Lizzy and The Stranglers. Graffiti Soul was produced by the band and Jez Coad and was mixed by Bob Clearmountain in Santa Monica, California. The songs were written in Rome, Sicily, Antwerp and Glasgow and the core line-up of Jim Kerr (vocals), Charlie Burchill (guitar, keyboards), Mel Gaynor (drums) and Eddie Duffy (bass) recorded the material at the famous Rockfield Studios in Wales, where Queen recorded Bohemian Rhapsody and The Stone Roses made their debut album. Simple Minds have a hard earned reputation as one of the world's most sensational live acts. Following the success of their sold-out 30th Anniversary concerts in 2008, the band have a busy summer of live dates lined up, including their special appearance at the Isle of Wight Festival and a Scottish homecoming gig at Edinburgh Castle on 18 July, where thye will perform the entirety of thier multi-million selling 1982 landmark album New Gold Dream (81,82,83,84). Graffiti Soul is further proof that Simple Minds are one of the few bands with both the musicianship and the staying power to survive the ever-changing music scene and still be selling out stadiums. Jim Kerr says: "We lvoe the fact that we're still out there. Thats' what we're doing and we've never felt so energised. We're delighted with this record. If you really love music, you'll come back to it with a passion irrespective of life's twists and turns. That's why I hope people get to hear Graffiti Soul - I think it's got legs." 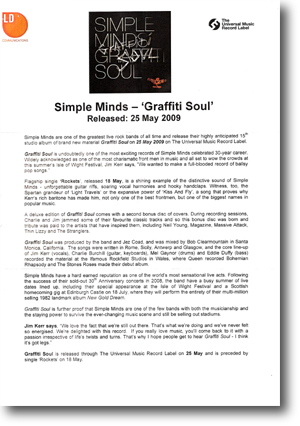 Graffiti Soul is released through The Universal Music Record Label on 25 May and is preceded by single Rockets on 18 May.